Drinking water with lemon is a great way to help reduce bloating because the natural acid in lemon help to stimulate hydrochloric acid (HCl) production in the stomach and support digestion. Drinking warm lemon water is best, however room temperature water works well too; just a squeeze of fresh lemon into a glass of water is all you need. Try drinking lemon water first thing in the morning to stimulate digestive juices, or drink a glass when you feel bloating coming on. Apple cider vinegar (or ACV) is a natural digestive aid and, much like lemon water, can help to stimulate hydrochloric acid production which activates digestive enzymes meant to adequately break down and digest your food. One tablespoon of ACV in 1/4 cup of water 20 minutes before a meal can help to stimulate the digestive process to reduce further bloating, or try incorporating it into your cooking and salad dressings. Although deliciously sweet, these fiber-rich foods are also rich in natural digestive enzymes. Pineapple contains the digestive enzyme bromelain, while papaya contains papain, which are both known to help with the digestion of protein. In cases of individuals with low stomach acid, chewing on papaya and pineapple after a meal or incorporating them into meals can help to reduce bloating. A time-tested digestive remedy, ginger helps to soothe and relax the digestive tract and reduce gas. Ginger is a highly effective carminative that alleviates bloating and cramps by expelling the gas and calming intestinal activity. A cup of ginger tea after meals or in the evening can help to reduce overall bloating, or you can also incorporate fresh ginger into the cooking of stew and broths for its medicinal properties. Natural digestion-soothing herbs like mint, dandelion, aloe vera and fennel have been used for thousands of years to soothe an uncomfortable belly. Mint specifically is helpful in reducing bloating as it is known to help relax smooth muscles and reduce cramping and spasm. Mint can be consumed by eating whole leaves, adding it to recipes, or in the form of a soothing peppermint tea. Probiotic foods contain the ‘good’ bacteria that help nourish the intestinal flora in our gut, and fermented foods like sauerkraut are ‘pre-digested’ meaning that they are rich in good bacteria while being easy on your digestive tract. Raw sauerkraut is rich in natural probiotics which can help to support digestion and promote beneficial intestinal flora. Use it as a condiment with meals, or chow down on a couple of fork fulls as a quick snack. Remember, not all bodies are created equal; therefore not everyone reacts to foods the same way. Diet, lifestyle and environmental factors can all affect a person’s digestive tract differently, and what’s good for one person is not necessarily good for another. Pay attention to your body. 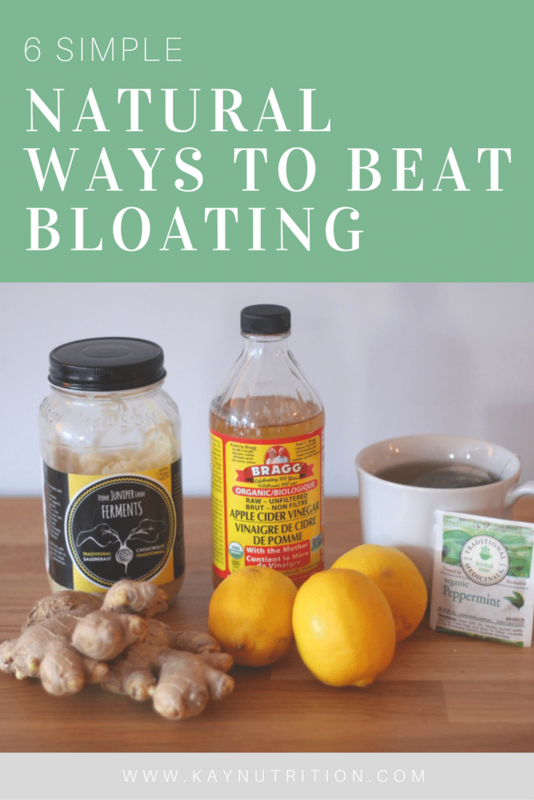 If you are constantly bloated, uncomfortable and experiencing digestive upset, odds are there is something that you are eating that is upsetting your digestion. You can use all of the digestive aids you want, but if you don’t remove the offending foods the issues will not stop. If you suspect something in your diet is causing bloating, begin my keeping a food diary and journaling your meals and your days. Try removing the suspected offending food and monitor any changes or improvements. If you have tried all of these recommendations with no success, you might need a more targetted approach so working with a holistic healthcare practitioner is recommended. Download my FREE 7-Day Meal Plan with quick, easy and healthy recipes and get started today! Thank you for this post- I feel like it was made just for me!